There’s nothing like proving how manly you are than a bit of good old fashioned arm wrestling but it’s not the sort of activity you can really do on you own, until now! The arm wrestling simulator is like one of those machines you used to see in dodgy arcades at the seaside but this one is available for your home. I must admit I’m not sure what sort of person would have one of these in their living room but if you do please send us a photo and I guarantee we’ll publish it. 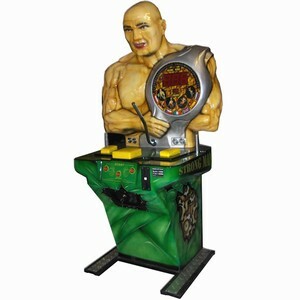 If you’ve got cash to burn you can pick up the baldie arm wrestling simulator from Drink Stuff for £3,288.99 (~ $6,600 or more simply, a lot). Id love to see someone submit a picture of that in their living room too. Thats beauty.